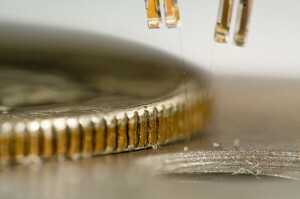 Three fingered self-sensing micro-robotic assembly tool developed by the instrumentation development group. The Instrumentation Development Group represents a broad collective of researchers interested in the development of instrumentation systems for the advancement of scientific and engineering technologies. Particular emphasis of our group is the adoption and application of new technologies for the creation of new scientific tools and industrial processes. If you are a scientist or engineer with a problem that requires instrumentation or processes that do not exist, or for which current solutions are inadequate, this could be an exciting opportunity to get involved. Our group currently occupies two, vibration-isolated, laboratory facilities (one of which is temperature and humidity controlled), within the Center for Precision Metrology housed on the ground floor of the Duke Centennial Building at UNC Charlotte. This group was initiated in 1994 by Professor Stuart Smith.